Luxury homes in the New York City market are homes which are priced higher than $10 million. There’s very little that you need to do differently if you want to sell luxury homes For Sale By Owner in NYC versus selling the average $2 million NYC apartment For Sale By Owner. Do I need special marketing? Are buyers’ agents more important? Do I need any special offline marketing? Do I need an agent with a deep personal network? Do you need to host open houses? How can I maintain privacy around my home sale? Because of the slightly increased sophistication of real estate agents in wealthier circles, luxury home owners are more likely to be duped by their agent “friends” into thinking that paying 6% commission is some sort of law and that they need to work with an agent specializing in luxury home sales. Little could be further from the truth. Real estate agents in NYC focused on the luxury market are often “momma’s boys” who are getting clients exclusively from their parents’ networks. As a result, the difference in service and marketing is zero versus working with an agent who is less entitled and more hungry. At Hauseit, we’ve proven that $10 million penthouse condos in Lower Manhattan and $20 million townhouses on the Upper West Side can be bought or sold with zero or significantly reduced broker fees. 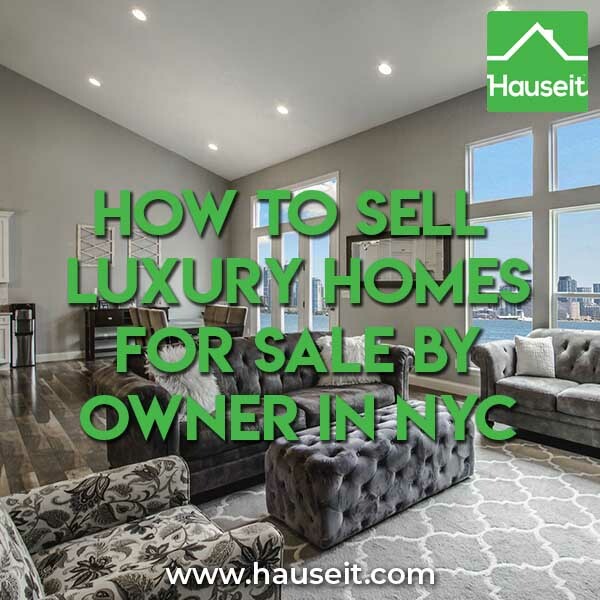 Do I need special marketing to sell luxury homes For Sale By Owner in NYC? No. The marketing exposure you’ll need to sell luxury homes For Sale By Owner in NYC is identical to that you’ll need to sell an average $2 million apartment in NYC. Most importantly, you’ll need access to the city’s shared listings database for brokers so you can effectively engage and offer commission to the city’s buyers’ agents. This shared property database is operated by REBNY and is called the RLS (REBNY Listing Service). While only brokers are allowed to list property in the RLS, you certainly don’t need to pay 6% or even 5% just to list your property there. 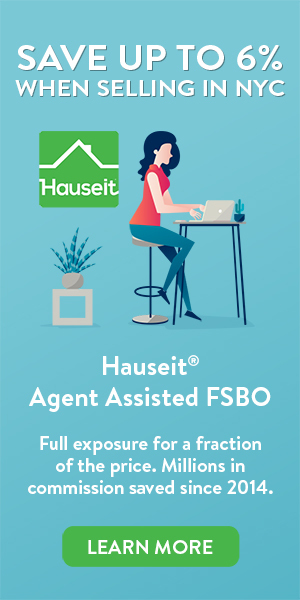 Through Hauseit’s Agent Assisted FSBO listing service, our brand name broker partners can list your home in the RLS for a small, one-time flat fee. No strings attached. Note: It’s important to work with a reputable broker who can list you in the RLS for flat fee versus just any discount broker as you don’t want to scare off buyers’ agents or give them any reason to doubt the validity of your co-broke. Does international real estate marketing matter? Read more in our study on why international real estate listing syndication schemes are largely a waste of money. Are buyers’ agents more important to sell luxury homes For Sale By Owner in NYC? Yes. 90% of all buyers in New York City are represented by real estate agents. That ratio of represented buyers is even higher once you enter the luxury market. Just like your average home buyer, luxury home buyers have at least 5 real estate agent friends who will tempt them with “free services” since broker commissions are a built-in seller closing cost. Luxury home buyers can be celebrities or heads of state who will have even less time than your average home buyer to search for properties on their own. As a result, very wealthy home buyers will almost always be assisted by a real estate agent. Fortunately, you can easily offer commission to and get the attention of the city’s buyers’ agents by listing your home through Hauseit’s flat fee MLS listing service. Every listing in RLS is contractually co-broked between firms, so buyers’ agents will know that if they send their buyer and close on your home, they’ll certainly be paid. Do I need any special offline marketing to sell luxury homes For Sale By Owner in NYC? No. Advertising your home on luxury magazines and newspapers is a scam perpetrated by luxury listing agents to justify their enormous commissions. All luxury home buyers will have at least 5 real estate agent friends who are keeping an eye on the market on their behalf. If the home buyer is actively searching, he or she will be consistently checking out listings sent by buyers’ agents or browsing popular real estate search websites. Hoping to catch the eye of a luxury magazine reader is not an effective way to generate interest in your home sale. In the unlikely event that a serious buyer notices a luxury home in a luxury magazine advertisement, you can be sure that the buyer’s agent has already sent the buyer that listing at least once. A buyer’s agent is highly motivated to show suitable listings to an active luxury home buyer, so you can be sure that the listing has already been shown to the buyer! Do I need an agent with a deep personal network to sell my luxury home in NYC? No. This is a scam perpetrated by luxury listing agents to justify you paying 6% commission to have them list your home in the RLS. As many luxury home owners have told us before, they felt that their traditional listing agents simply listed their home online and sat back to wait for their phone to ring. A deep personal network is meaningless today when it comes to selling luxury real estate in NYC. Over 98% of buyers start their home search online. The rest start by speaking with a real estate agent. Through Hauseit’s flat fee MLS listing service, you’ll be listed in the RLS plus dozens of popular real estate search websites such as StreetEasy, Zillow, Trulia, Brownstoner and more. By default, you’ll be able to reach every buyer whether they are represented or unrepresented. Think about it, if a wealthy buyer is in the market to buy a home like yours, either they will see your home directly online or their buyers’ agents will see it for them on RLS. The buyer will either contact your listing directly or reach out through their buyer’s broker. The fact that your luxury agent “friend” attends dinner parties with minor celebrities has no bearing on your home’s exposure to potential buyers. Don’t get blinded by the fluff! Do you need to host open houses to sell luxury homes For Sale By Owner in NYC? No. Many luxury homes are sold without ever hosting an open house. However, there is too much bias on the internet against hosting open houses for luxury listings due to the possibility of unqualified buyers and even thieves showing up. The former is a non-issue as it’s always better to have more exposure, word of mouth and even press about your listing. Reporters are known to show up to luxury open houses unannounced so it could be a way to get free press about your listing! The danger of criminals entering your home is a much more significant reason to re-consider hosting an open house. You could try holding an open house by appointment only; however, you still risk people showing up unannounced and saying that they didn’t know you had to make an appointment. Due to the high levels of security already present in most luxury buildings, the most common danger is petty theft at luxury open houses. You can mitigate this danger by locking away valuables and either posting trusted security guards, or simply signing up for Hauseit’s Full Service for 1% listing service. With Hauseit’s Full Service for 1% listing option, you’ll receive all of the benefits of a traditional listing with a brand name real estate brokerage for only a fraction of the commission. Furthermore, our partner agents will be on site at your open house to monitor visitors and help secure your home! Another option that is possible with Hauseit’s Full Service for 1% listing option is for our partner brokers to hold a “broker open house.” Our highly rated partner brokers will post an open house that is marked “broker only” in the RLS which will not show up on any public websites. This is a great way to invite all of the luxury brokers in the area to preview the listing on behalf of their buyers so they can speak intelligently about the home with their clients. What if you forgot to purchase your home in a LLC and your name is exposed in public records? What if you’re a celebrity or simply someone who doesn’t want public scrutiny over your lifestyle and personal residence? You can address all of these issues through a private listing in RLS whereby your listing is visible to brokers only, but not posted on any public real estate search websites like Trulia. This approach is actually fairly common for luxury listings in NYC. For example, a recent buyer’s broker commission rebate customer asked for a list of properties priced between $7-15mm in a posh section of the Upper West Side. All 11 available listings were private and only posted in RLS! If you decide to pursue this route, we highly recommend hiring one of our brand name broker partners for only 1% commission! They’ll play a critical role in screening inquiries and speaking with buyers’ agents to find out more about their buyers, and confirming with you before allowing them to visit your home. Ironically, the only differences between the listing agent duties for a luxury home versus a normal home in NYC consists of off-market advertising through the RLS, not hosting open houses and screening buyer inquiries more carefully. Is that worth paying 6% of $10 million, or $600,000 for?